Before the arrival of Imperial Russian troops in Crimea in 1783, Bakhchisarai was the capital of a Tatar kingdom. 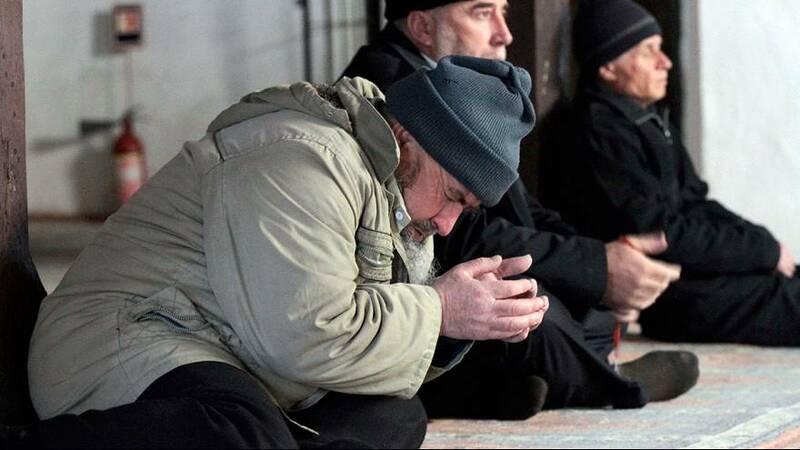 Today’s tense mood, one year after the Russian Federation’s annexation of the peninsula, has brought back old fears among Crimea’s Tatars, who make up around 13% of its population. In Simferopol, just one independent TV station, ATR, is still serving the region’s Tatars. Human rights groups have expressed concern over a crackdown on the freedom of the media. The man running a workshop we visited in Ukraine’s capital, Kyiv, fled Simferopol just before Crimea was annexed. Rustem Skibin told us he was afraid he would be singled out for promoting Tatar culture. Among the many things he crafts are ceramics and musical instruments. He plays one of them for us. Tamila Tasheva is a coordinator with the NGO Crimea-SOS, which helps care for some 20,000 Tatars displaced from Crimea. Yet there are some Crimean Tatars who say they support the Russian annexation, such as the Deputy Prime Minister of Crimea, Ruslan Balbek. Among those who have sought refuge is Mustafa Dzhemilev, revered as a father figure. He says that most Tatars — their basic freedoms increasingly restricted — have no wish to be Russian. The leader of the Tatars, who opposed Russia’s annexation of the Ukrainian region, cannot go back. It has been almost a year since Refat Chubarov was temporarily exiled from his ancestral homeland. We talked to him in Kyiv about what he has lost. The Tatars are the peninsula’s indigenous Muslim people but have long been a minority — of some 240,000. Openly resisting the annexation, many boycotted the referendum on the status of Crimea, organised by the pro-Russia Autonomous Republic within Ukraine. Soviet leader Joseph Stalin deported all the Crimean Tatars in 1944, moving them to Central Asia, as collective punishment for alleged collaboration with the Nazis in World War Two. It was only in the late 1980s that they could return. Tatars describe harassment, intimidation and violence, including abductions and arrests on false accusations. Chubarov warns that worse is to come. Crimea’s de facto authorities have banned Chubarov till 2019. In the meantime, he urges more international sanctions be brought against Russia.